Cheetah Keychain Pepper Spray. Includes black leather case with silver glitter rhinestones and keychain. 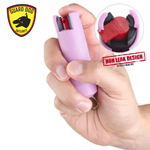 This pepper spray is most effective when it makes contact with the assailants eyes, nose, and mouth. Wind and other conditions such as rain may effect the sprays range. Do not spray into the wind if possible, to avoid getting the spray in your own eyes. Up to 6 shots, blasts up to 12 feet! 1. Unlock the red actuator button by sliding the flat red tab to the right so the red tab aligns with the small cut out of the black cap. CAUTION: pepper spray is now armed. 2. Point the pepper spray release hole toward the face of the assailant or the target. 3. Push down firmly on the red tab marked press using short bursts. Pepper spray will squirt about 8 to 12 feet in stream. WARNING: STRONG IRRITANT UNDER PRESSURE. DO NOT PUNCTURE. IN CASE OF CONTACT FLUSH EYES AND SKIN WITH COLD WATER. CONSULT A DOCTOR IF IRRITATION PERSISTS.